Plot Summary: Game loving Mutou Yugi was given an ancient relic by his grandfather called the Sennen (Thousand-Year) Puzzle. He completed the puzzle and was possessed by the spirit of an ancient Pharaoh. The Pharaoh has no memories of who he is or how he got in the puzzle to begin with. The Pharaoh looks out for Yugi and his friends and Yugi agrees to help the Pharaoh recover his lost memory and help him be put to rest so he can go on to the afterlife and finally leave Yugi's body. Yugi, a seemingly normal boy, was given the Millenium Puzzle by his Granfather. But then, Yugi's Grandfather's soul was trapped inside a Duel Card, a card from a game that many play in tournaments. Now Yugi Must Duel his way to the one who entrapped his Grandfather, with help from the Millenium Puzzle, and save him. Comments: 50 eps in 5 dvd disc with: Ac3 2.0 Channel Audio English/Off subtitled Original Japanese Dialogue and English Dialogue Perfect Collection. 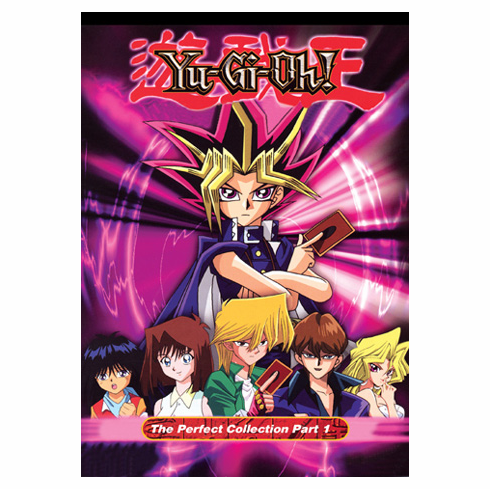 Comments: 48 eps in 5 dvd disc with: Ac3 2.0 Channel Audio English/Off subtitled Original Japanese Dialogue and English Dialogue Perfect Collection.